I wanted to visit Josephine’s Bistro since I was first introduced to them in “Fire in the Triad: Battle Rabbit.” Days before they altered their summer menu, I managed to sneak in and try a few dishes. A cool, cozy ambiance features wooden accents, and a notable rolling pin bookshelf. I want this in my kitchen at home. The large, inviting bar in the back of the restaurant leads out to limited seating on a patio. The number of tables makes dining outside feel exclusive. Lady freebies (nail files, bobby pins, etc.) in the bathroom are most appreciated. Any restaurant that offers wine samples gets an A+ in my book. Our well-versed and knowledgeable server offered me two “blind” samples, and it turns out, I favored the Malbec over the Merlot. Sun-dried tomato “focaccia” had more of a cornbread texture, but the flavor of the tomatoes was a perfect combination of sweet and tangy. Sun-dried tomato oil was heaven to saturate the bread with. I would bathe in this. Mushroom Ravioli are pillows of perfection, and obviously house made. Whiskey notes are present in Makers Mark Crème Fraiche, though the chef was a bit heavy handed with the sauce – I didn’t want the little raviolis to drown. Spinach Pesto and White Truffle Oil provide an earthy complement to the sauce. 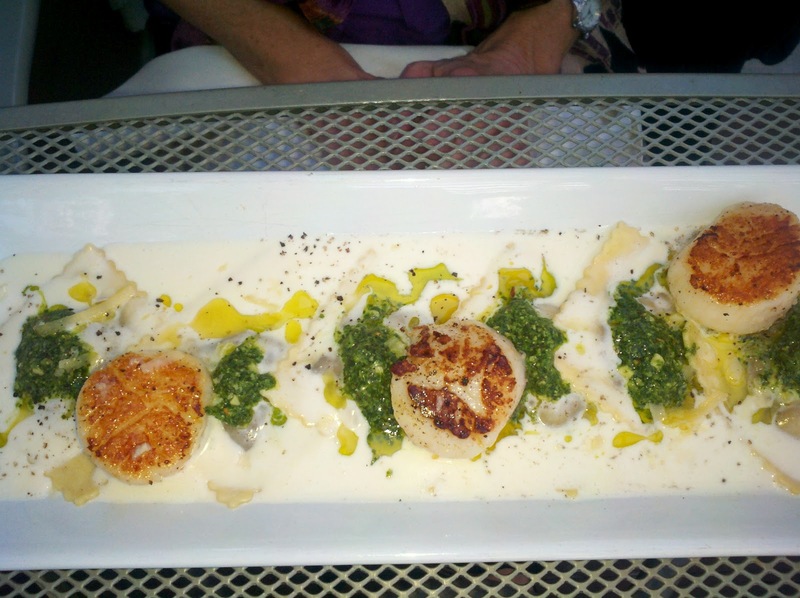 The server suggested the addition of Grilled Jumbo Sea Scallops – a wise recommendation. What’s listed as an appetizer was easily made an entrée with this adjustment. 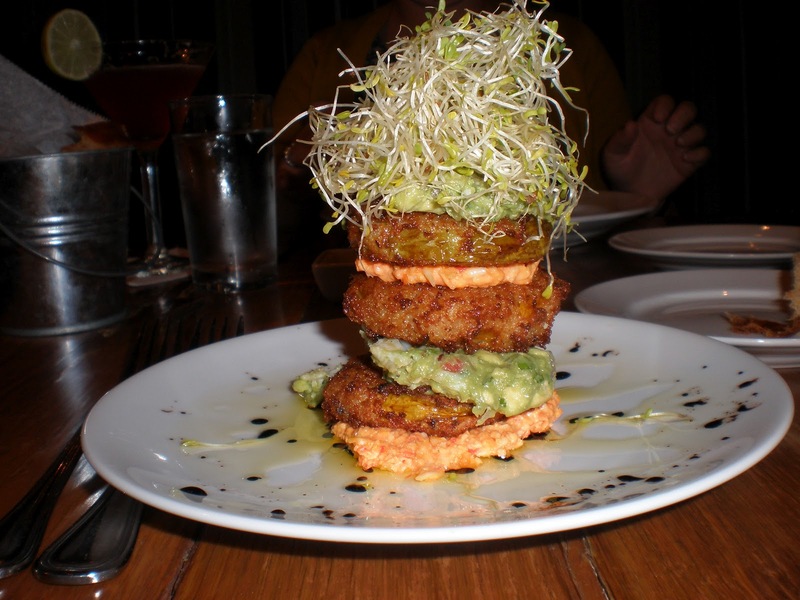 Fried Green Tomato Napoleon stacks layers of perfectly crispy green tomatoes with avocado and lump crab, alternately with Parmesan Pimento Cheese. Crazy cool presentation. 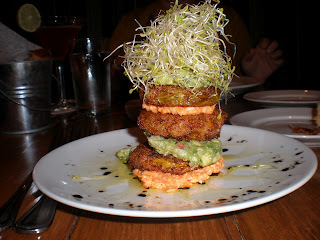 The fried coating on the tomatoes didn’t taste at all greasy or soggy, and the creamy avocado and freshness of the lump crab made for a very decadent dish. Being a pimento cheese snob, I enjoyed this variation, though I didn’t pick up as many Parmesan notes as Cheddar. This is a quintessential Southern dish, with the volume turned way up. 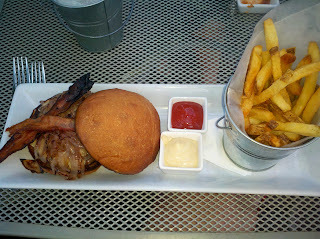 Though I didn’t really need the mound of alfalfa sprouts on top. Josephine's offers tons of weekly specials (half-priced appetizers on Monday and free wine tastings on Thursday). I look forward to returning to check out their adventurous winter menu.